I just completed creating a display for a joint marketing venture with Carmel Monon Center, Ritz Charles, BBJ Linen, and A Classic Party Rental. 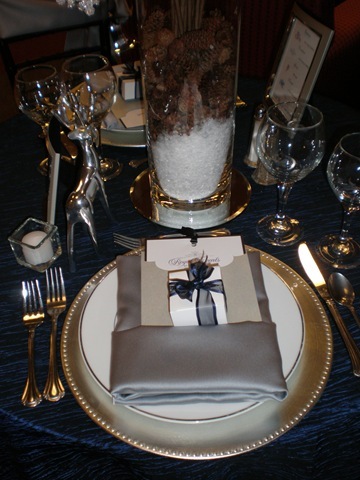 It is always a pleasure working with Casey (Carmel Monon Center), Jesse (BBJ Linen), and Mike (A Classic Party Rental). I wanted something simple, but elegant. The Monon Center has beautiful floor to ceiling windows that open to a natural wooded setting. My goal was to capture that look and feel and bring it inside. I placed snow glistening branches with falling snowflakes in a large cylinder vase filled with miniature pinecones and snow. 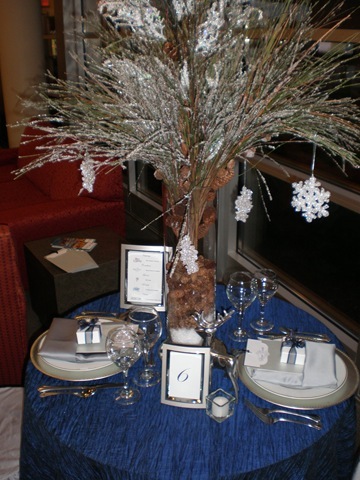 For a fun touch I added a silver deer next to the table number. Silver bells hang from silver Lamour sashes. 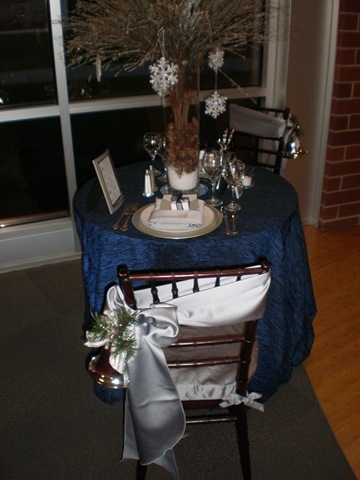 I like the asymetrical sashes on the chairs too!